We’ve not blogged for a while, but have been busily working away on our analyses and writing up the findings of the Beyond Greenspace project. We’ll post key findings here as soon as they’re peer-reviewed and published. Back in June we held a symposium at the RGS-IBG, right next to Hyde Park, one of London’s amazing public green spaces. It got booked up very quickly, so sorry to anyone that didn’t manage to get a seat. We’ve been thinking a lot about the conversations we had, and have been starting up some exciting new collaborations with some of the organisations that helped to make it a really useful and stimulating day. For a succinct summary of thoughts from the day, here’s a ‘Storify’ of tweets from the event. We took part in the first conference of Green Connect, a new network developed to bring together people and organisations managing green spaces and to advocate for the importance of parks and other open natural spaces. It was inspiring to hear about all the great things that are happening in our parks and gardens around the country, such as Nesta’s Rethinking Parks programmes, and the new Parks Alliance, an important umbrella group of various relevant organisations. who have the tag line ‘access to quality green space for all’. This was all set in the context of the massive challenges faced by UK parks in the coming years due to national/local government funding reductions, as argued by the Heritage Lottery Fund in their State of UK Public Parks report presented at the conference. See here for some lowdown on the day. 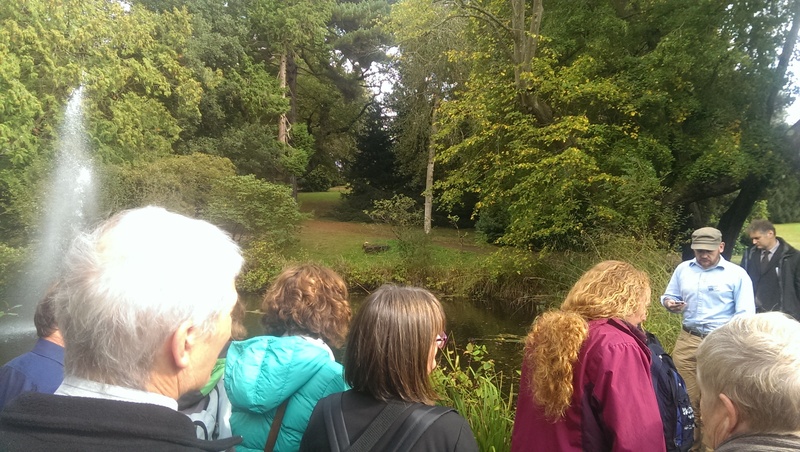 It was a great conference to go on a guided walk of the University of Exeter’s 160ha Streatham campus, a lot of knowledgeable green space managers and horticulturalists! We’ve just published another piece of work using the Monitor of Engagement with the Natural Environment, Natural England’s fantastic survey that gives us insights into people’s visits to natural places and all sorts of useful data about the interactions people have with nature. Led by Dr Mat White, the research indicated that people living nearer the coast were more likely to meet the government’s physical activity target than those living further inland, even after we’ve accounted for lots of other influences such as age and socio-economic status. These data allow us to tease this apart and to show that this is explained by actual visits to the coast (and therefore it isn’t just that e.g. people at the coast are more likely to go to the gym). Interestingly, we also found that the coastal proximity effect is strong on the western coasts of England – but pretty much non-existent on the east. Lots of questions remain unanswered! The paper is published in the journal Preventive Medicine, and is summarised here on the European Centre website, with links to the paper and a short film in which Mat describes this and related work. Cornwall Wildlife Trust are represented on the advisory board of the Beyond Greenspace project, and we’ve been having various discussions around how this kind of research can be beneficial for what the organisation does, in the region and beyond. We’re also working with data from the Environmental Records Centre for Cornwall and the Isles of Scilly, and figuring out how we can use detailed local environmental data with other secondary health datasets to address our research questions.